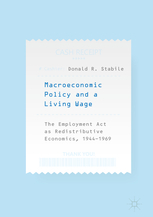 서명/저자 Macroeconomic policy and a living wage : the employment act as redistributive economics, 1944-1969 / by Donald R. Stabile. 발행사항 Cham : Palgrave Macmillan , 2018. This book offers a new interpretation of the Employment Act of 1946. It argues that in addition to Keynesian economics, the idea of a living wage was also part of the background leading up to the Employment Act. The Act mandated that the president prepare an Economic Report on the state of the economy and how to improve it, and the idea of a living wage was an essential issue in those Economic Reports for over two decades. The author argues that macroeconomic policy in the USA consisted of a dual approach of using a living wage to increase consumption with higher wages, and fiscal policy to create jobs and higher levels of consumption, therefore forming a hybrid system of redistributive economics. An important read for scholars of economic history, this book explores Roosevelt’s role in the debates over the Employment Act in the 1940s, and underlines how Truman’s Fair Deal, Kennedy’s New Frontier and Johnson’s Great Society all had the ultimate goal of a living wage, despite their variations of its definition and name.